INC Report to the NANC 10/10/2007 1 Industry Numbering Committee (INC) Report to the NANC October 10, 2007 Ken Havens, INC Chair Adam Newman, INC Vice. 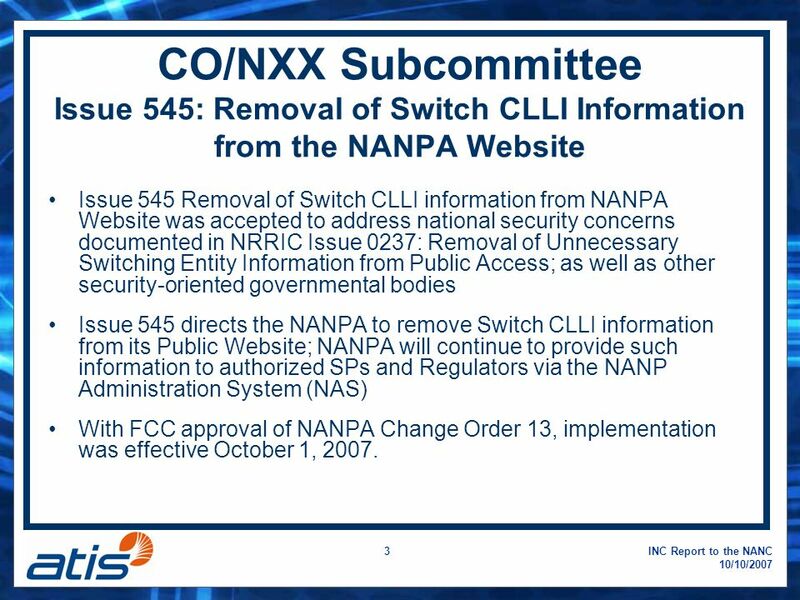 3 INC Report to the NANC 10/10/2007 3 CO/NXX Subcommittee Issue 545: Removal of Switch CLLI Information from the NANPA Website Issue 545 Removal of Switch CLLI information from NANPA Website was accepted to address national security concerns documented in NRRIC Issue 0237: Removal of Unnecessary Switching Entity Information from Public Access; as well as other security-oriented governmental bodies Issue 545 directs the NANPA to remove Switch CLLI information from its Public Website; NANPA will continue to provide such information to authorized SPs and Regulators via the NANP Administration System (NAS) With FCC approval of NANPA Change Order 13, implementation was effective October 1, 2007. 4 INC Report to the NANC 10/10/2007 4 LNPA Subcommittee Issue 519: Pool Replenishment At the request of the PA and the NOWG, the INC explored options to ensure that the PA is able to maintain a sufficient quantity of blocks available for assignment to satisfy the anticipated demand while maintaining no more than a six-month inventory, per the Thousands- Block Pooling Contractor Technical Requirements document, section 2.14.1. 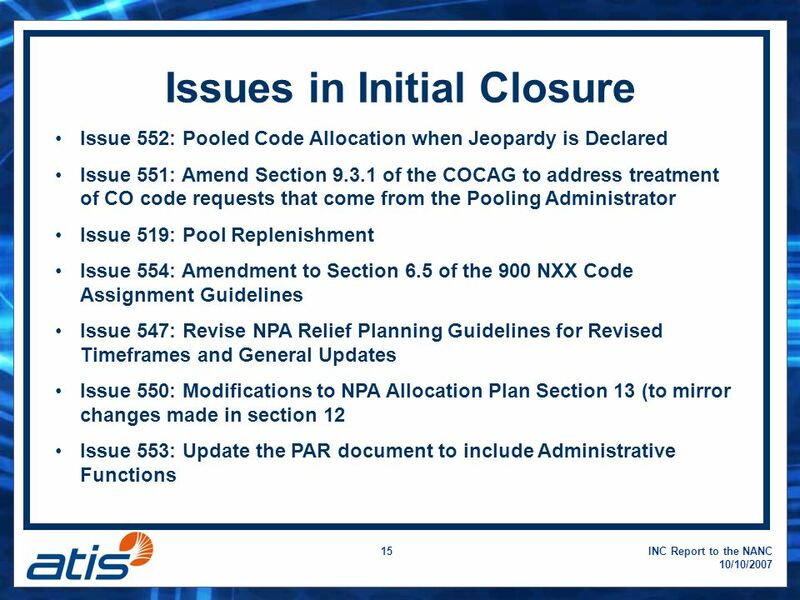 A number of options, including forcing an SP to open a new code, were found to be either unenforceable or could have had negative impacts on end users. 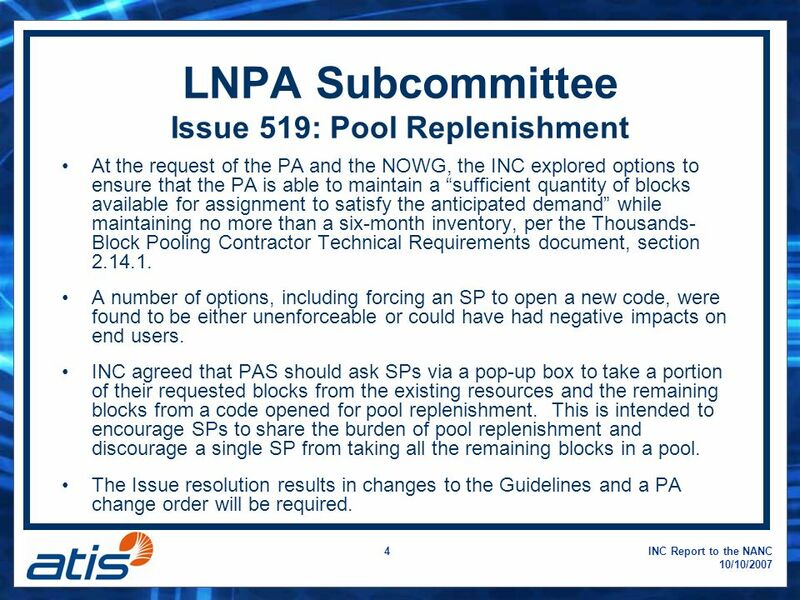 INC agreed that PAS should ask SPs via a pop-up box to take a portion of their requested blocks from the existing resources and the remaining blocks from a code opened for pool replenishment. 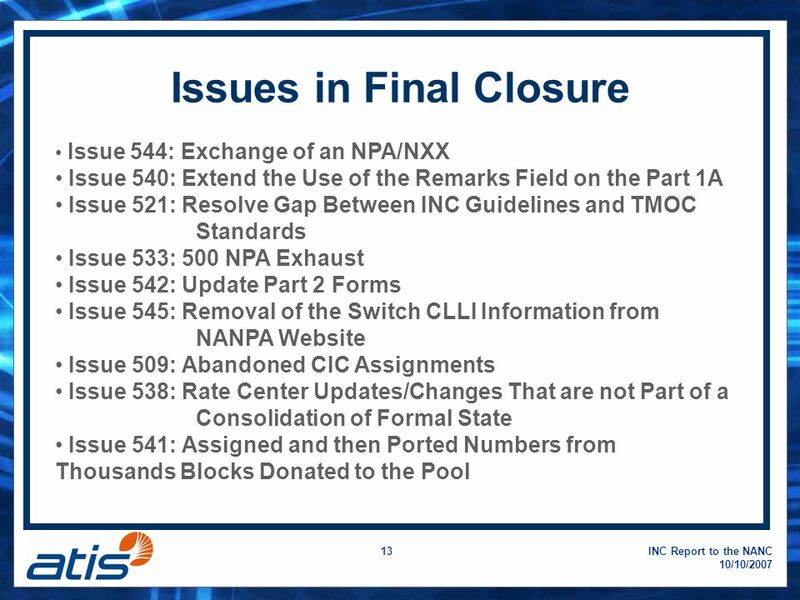 This is intended to encourage SPs to share the burden of pool replenishment and discourage a single SP from taking all the remaining blocks in a pool. 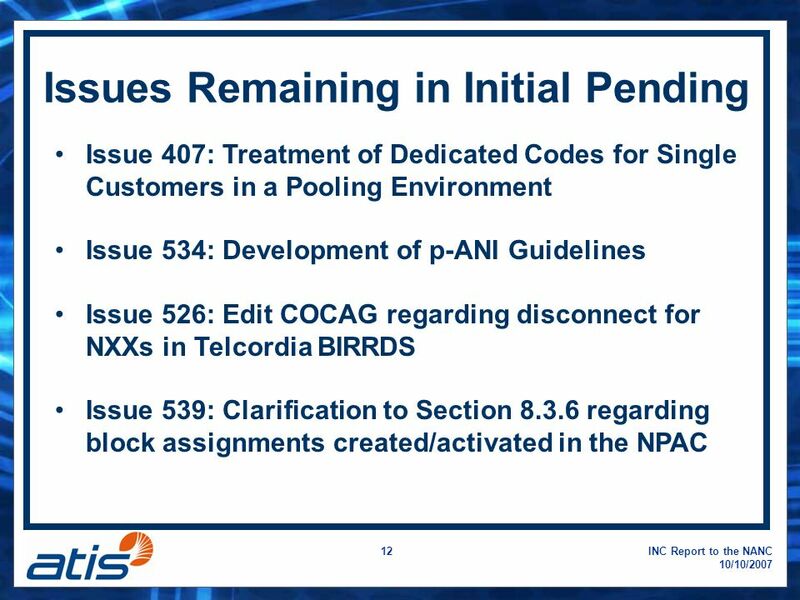 The Issue resolution results in changes to the Guidelines and a PA change order will be required. 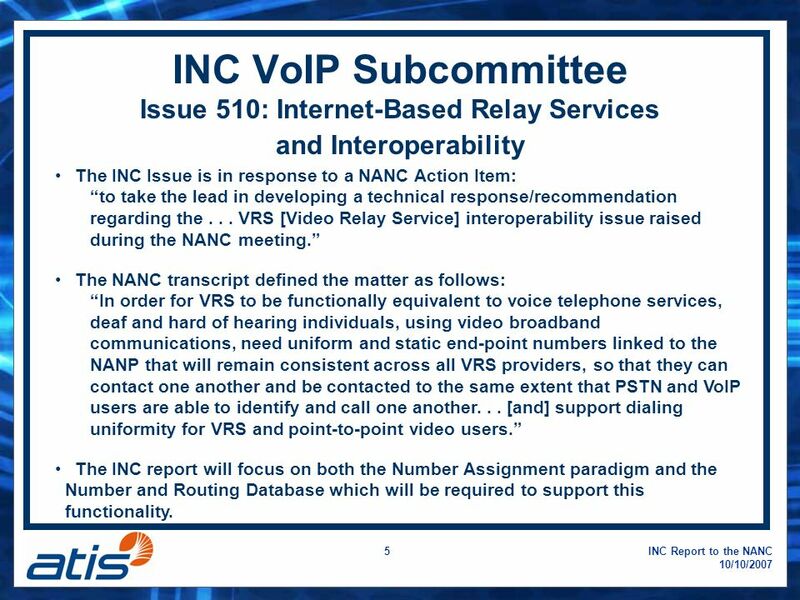 5 INC Report to the NANC 10/10/2007 5 INC VoIP Subcommittee Issue 510: Internet-Based Relay Services and Interoperability The INC Issue is in response to a NANC Action Item: to take the lead in developing a technical response/recommendation regarding the... VRS [Video Relay Service] interoperability issue raised during the NANC meeting. 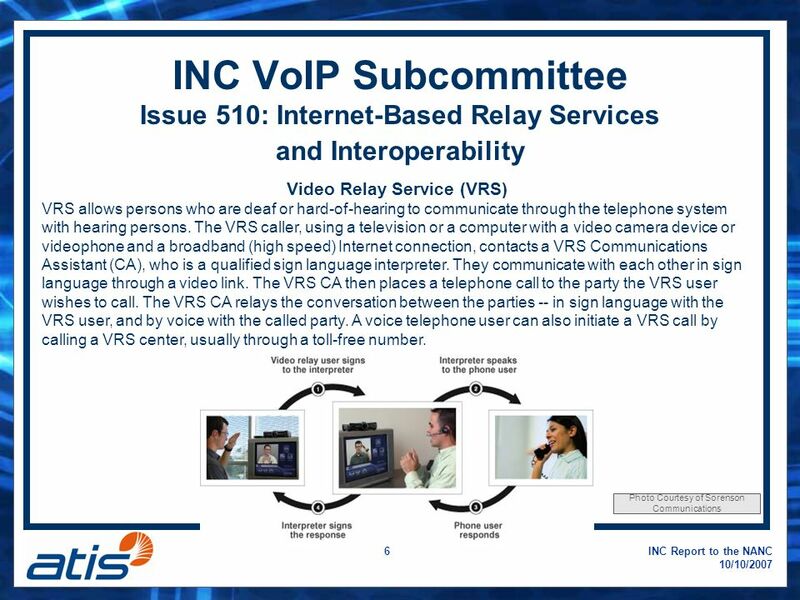 The NANC transcript defined the matter as follows: In order for VRS to be functionally equivalent to voice telephone services, deaf and hard of hearing individuals, using video broadband communications, need uniform and static end-point numbers linked to the NANP that will remain consistent across all VRS providers, so that they can contact one another and be contacted to the same extent that PSTN and VoIP users are able to identify and call one another... [and] support dialing uniformity for VRS and point-to-point video users. The INC report will focus on both the Number Assignment paradigm and the Number and Routing Database which will be required to support this functionality. 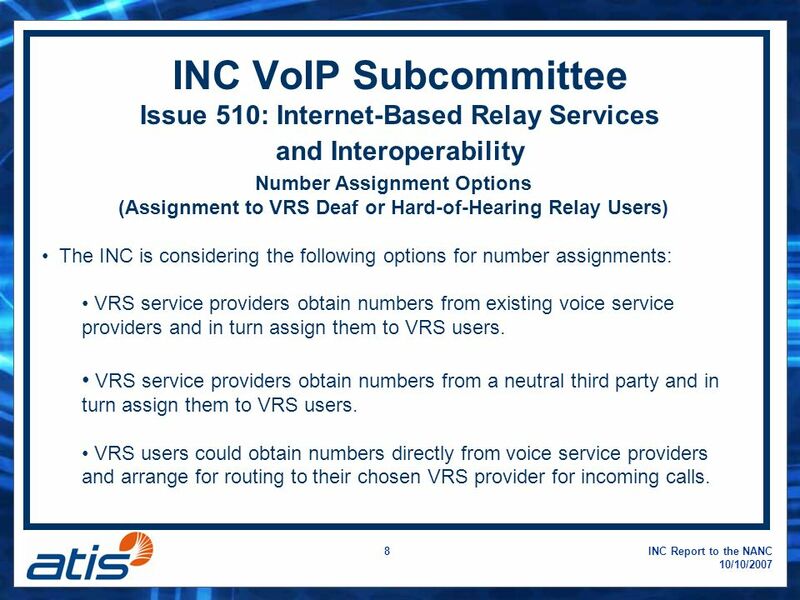 8 INC Report to the NANC 10/10/2007 8 INC VoIP Subcommittee Issue 510: Internet-Based Relay Services and Interoperability Number Assignment Options (Assignment to VRS Deaf or Hard-of-Hearing Relay Users) The INC is considering the following options for number assignments: VRS service providers obtain numbers from existing voice service providers and in turn assign them to VRS users. VRS service providers obtain numbers from a neutral third party and in turn assign them to VRS users. VRS users could obtain numbers directly from voice service providers and arrange for routing to their chosen VRS provider for incoming calls. 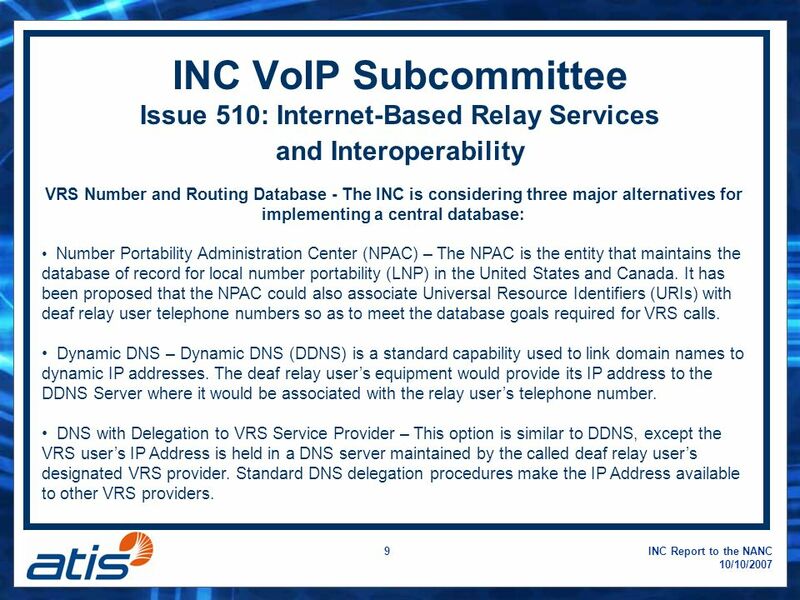 9 INC Report to the NANC 10/10/2007 9 INC VoIP Subcommittee Issue 510: Internet-Based Relay Services and Interoperability VRS Number and Routing Database - The INC is considering three major alternatives for implementing a central database: Number Portability Administration Center (NPAC) – The NPAC is the entity that maintains the database of record for local number portability (LNP) in the United States and Canada. It has been proposed that the NPAC could also associate Universal Resource Identifiers (URIs) with deaf relay user telephone numbers so as to meet the database goals required for VRS calls. Dynamic DNS – Dynamic DNS (DDNS) is a standard capability used to link domain names to dynamic IP addresses. The deaf relay users equipment would provide its IP address to the DDNS Server where it would be associated with the relay users telephone number. DNS with Delegation to VRS Service Provider – This option is similar to DDNS, except the VRS users IP Address is held in a DNS server maintained by the called deaf relay users designated VRS provider. Standard DNS delegation procedures make the IP Address available to other VRS providers. 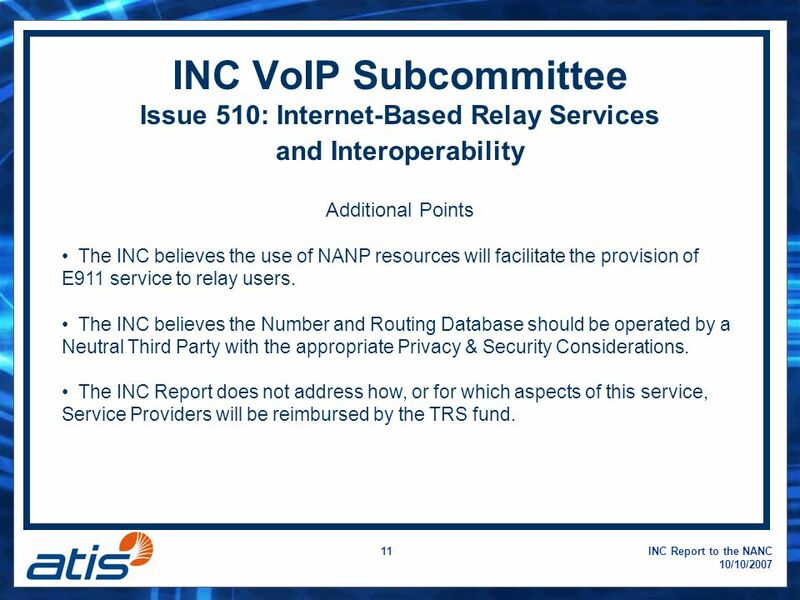 10 INC Report to the NANC 10/10/2007 10 INC VoIP Subcommittee Issue 510: Internet-Based Relay Services and Interoperability The INC Report: Status The draft report currently contains over 50 pages comprised of 7 sections and 4 appendices based on over 100 contributions towards the development of the report. The report is expected to contain a section that identifies components determined to be outside the scope of INC, but items that need to be considered in the overall design and implementation to achieve VRS Interoperability. 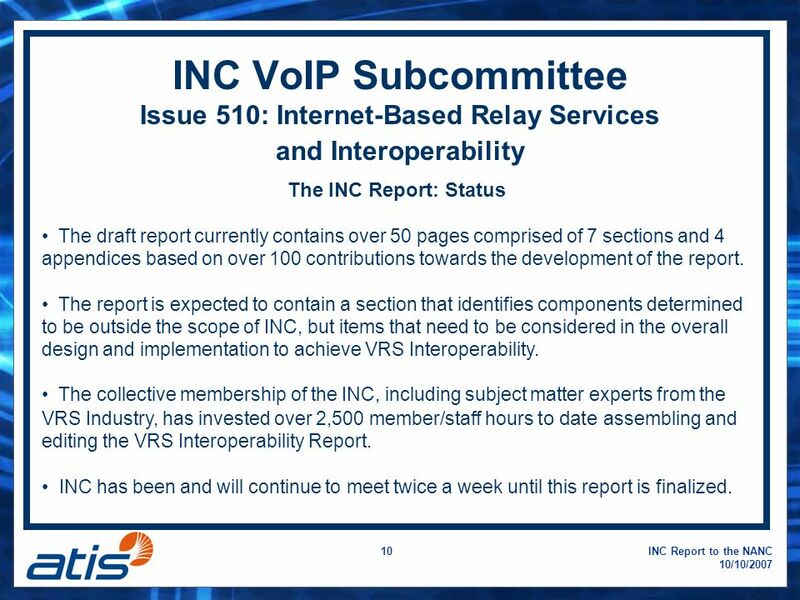 The collective membership of the INC, including subject matter experts from the VRS Industry, has invested over 2,500 member/staff hours to date assembling and editing the VRS Interoperability Report. INC has been and will continue to meet twice a week until this report is finalized. 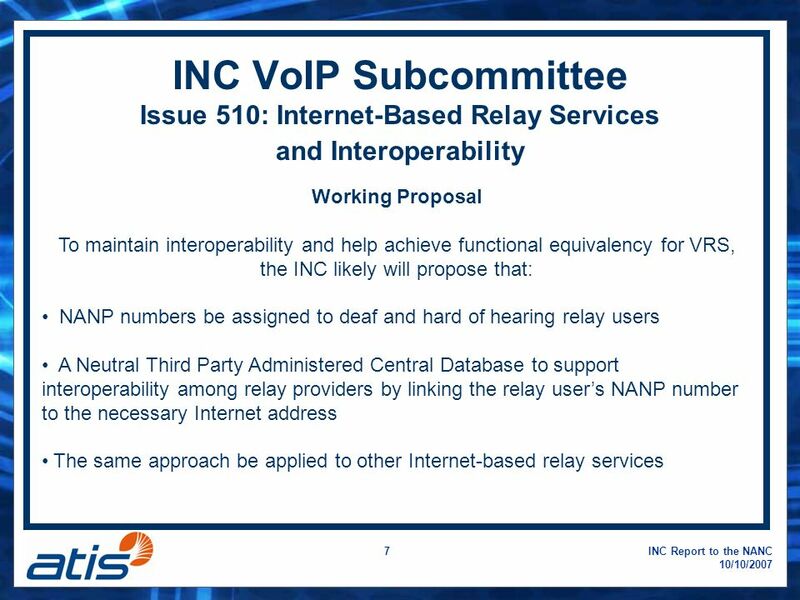 11 INC Report to the NANC 10/10/2007 11 INC VoIP Subcommittee Issue 510: Internet-Based Relay Services and Interoperability Additional Points The INC believes the use of NANP resources will facilitate the provision of E911 service to relay users. The INC believes the Number and Routing Database should be operated by a Neutral Third Party with the appropriate Privacy & Security Considerations. The INC Report does not address how, or for which aspects of this service, Service Providers will be reimbursed by the TRS fund. 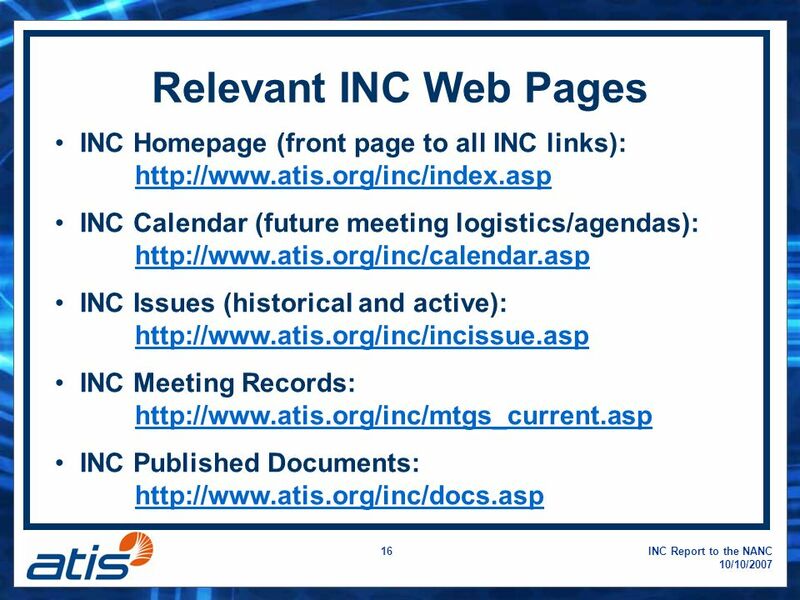 Download ppt "INC Report to the NANC 10/10/2007 1 Industry Numbering Committee (INC) Report to the NANC October 10, 2007 Ken Havens, INC Chair Adam Newman, INC Vice." 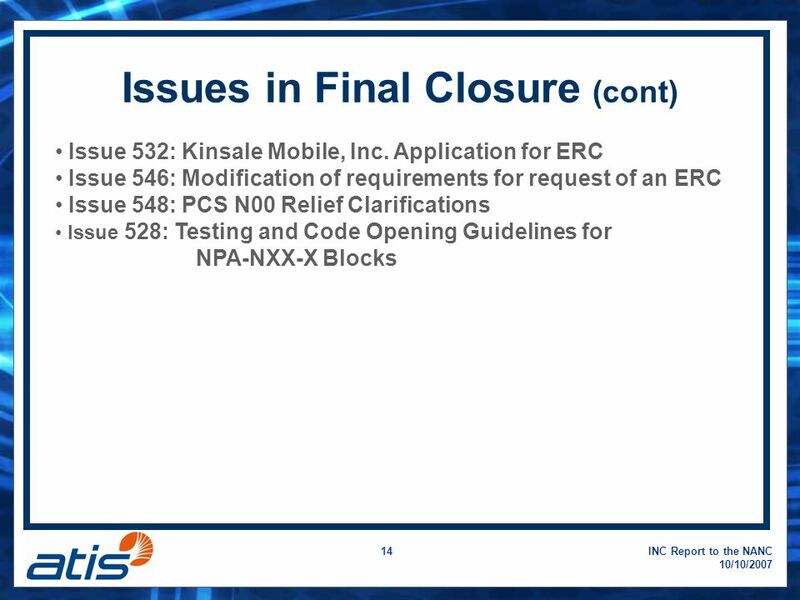 Telephone Numbers and E9-1-1 for Video Relay Service - Leveraging Existing Solutions December 4, 2007 Adapted from a presentation given to NECA TRS Subcommittee. INC Report to the NANC – May 18, INC Report to the NANC May 18, 2004 Ken Havens - INC Chair Adam Newman - INC Vice Chair. National Thousands Block Number Pooling Services NANC Meeting May 13, 2003. National Thousands Block Number Pooling Services NANC Meeting July 13, 2004. NANC Change Order 400 Joint FoN/LNPA WG Meeting April 14, 2005 Tom McGarry NeuStar, Inc.
1 INC Report to the NANC October 2001 Norman Epstein INC Moderator. INC Report to the NANC September 2001 Norman Epstein INC Moderator. 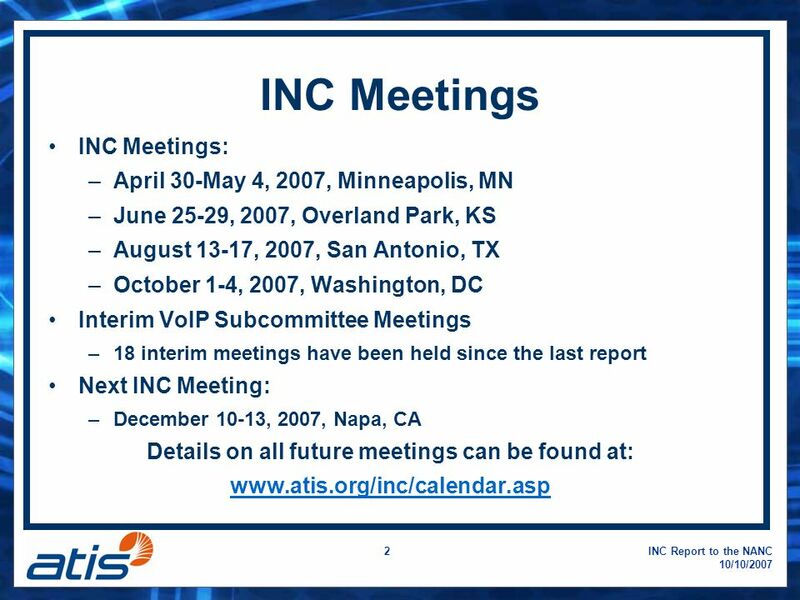 INC Report to the NANC – July 19, Industry Numbering Committee (INC) Report to the NANC July 19, 2005 Ken Havens - INC Chair Adam Newman - INC Vice. 1 INC Report to the NANC March 19, 2003 Dana Smith - INC Moderator Ken Havens - INC Assistant Moderator. Industry Numbering Committee (INC) Report to the NANC February 18, 2010 Adam Newman, INC Chair Natalie McNamer, INC Vice Chair. NANC Report Numbering Oversight Working Group (NOWG) May 17, 2005 Co-Chairs: Rosemary Emmer, Nextel Karen Riepenkroger, Sprint. 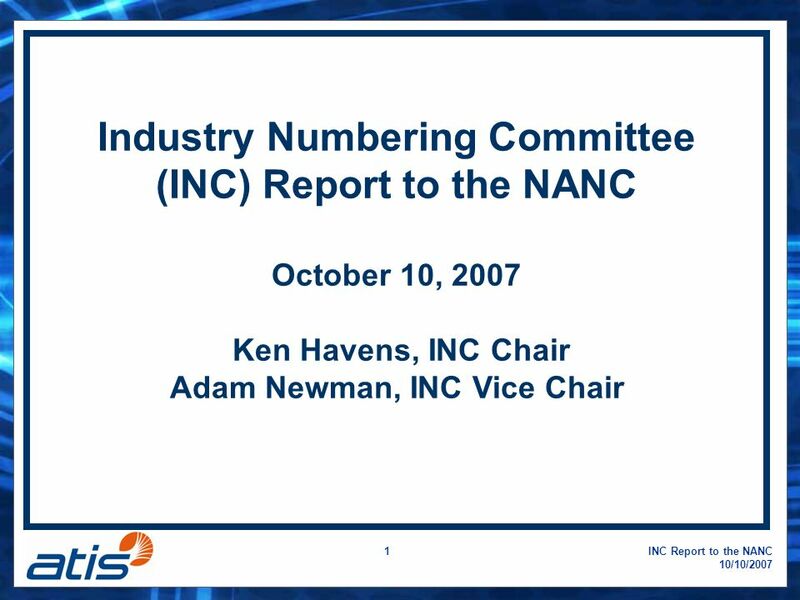 INC Report to the NANC – November 30, Industry Numbering Committee (INC) Report to the NANC November 30, 2005 Ken Havens - INC Chair Adam Newman. NANC Report Numbering Oversight Working Group (NOWG) January 19, 2005 Co-Chairs: Rosemary Emmer, Nextel Karen Riepenkroger, Sprint.